This is the second in this series. The first one talks about a Christian element of the song. “Question” is a 1970 single by the English progressive rock band The Moody Blues. It was written by guitarist Justin Hayward, who provides lead vocals. “Question” was first released as a single in April 1970 and remains their second highest charting song, reaching number two and staying on the chart for 12 weeks. It was later featured as the lead track on the 1970 album A Question of Balance. 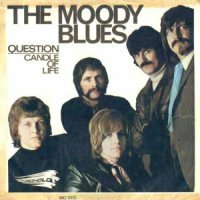 The single also features the song “Candle of Life” on its B-side, which was from the Moody Blues’ previous album To Our Children’s Children’s Children. Originally, the song itself was also to have been named “A Question of Balance,” but was shortened to “Question.” The lyrics of the chorus, “Why do we never get an answer, when we’re knocking at the door/ With a thousand million questions about hate and death and war?”, represented Hayward’s feelings and attitude toward the Vietnam War. At the time, “Question” was a simple recording for the Moody Blues. Their previous album, To Our Children’s Children’s Children, featured songs which included many different sounds provided by overdubbing and double-tracking. Unfortunately, this made most of the songs on the album very difficult to perform live. For this reason, “Question” was recorded in one take, and did not need any overdubbing or double-tracking, making it easier for the Moody Blues to perform live. It was written in Open-C tuning (CGCGCE) and recorded (and usually performed live) on a 12-string acoustic guitar. The song alternates between two different melodies: a fast-paced section (“Why do we never get an answer…”) and a slower one (“It’s not the way that you say it when you do those things to me…”). Hayward has said that these were originally two separate half-completed songs, but he realized that with a simple chord change, he could merge the two into a single song. “Question” is one of the Moody Blues’ most popular songs, and has been included in virtually all of their compilations and live albums. In addition, the song was re-recorded (along with “Isn’t Life Strange“) in the studio with the London Symphony Orchestra (who in 1978 had released an orchestral cover of the song) in 1988, for the Greatest Hits album. Former Marillion singer Fish covered the song as one of his personal favourites for his album Songs from the Mirror, released in 1993. Jump up^ Mawer, Sharon. “Songs from the Mirror”. AllMusic. Retrieved 27 August 2015.